Purple loosestrife is a pink or purple flowered perennial wetland species that originates in Eurasia but is now established in North America. It is found in most US states and Canadian provinces (USDA 2010). It has been present in Canada for many decades (a specimen was collected near Quebec City in 1883) (Environment Canada 2007). However, there are no collections for purple loosestrife in the UBC herbarium prior to 1950, so it is a more recent arrival in British Columbia. Purple loosestrife is a significant invasive species in wetlands. It can reproduce both by seed and vegetative propagation, and one plant can produce millions of seeds. Research has clearly shown that purple loosestrife displaces native wetland species (Gaudet and Keddy 1988, Urbatsch 2000). Biological control has had mixed success, including in British Columbia (Myers 1999). Perennial herb from a rhizome; stems erect, simple to branched above, 4-angled, 50-200 cm tall. Basal leaves lacking; stem leaves opposite, or sometimes whorled in 3's or sometimes alternate above, especially the basal ones, lanceolate, 3-10 cm long, pointed at the tips, more or less cordate at the bases, short-hairy to soft-hairy. Inflorescence of crowded, terminal, but interrupted, bracted spikes; hypanthium elongate-cylindric to conic, purplish, 4-5 mm long; petals 5, 6 or lacking, purple, 7-10 mm long. 1. Hypanthium elongate-cylindric to conic, several times as long as thick; petals 5, 6 or lacking,usually showy. A fourth species of Lythrum is now recognized in BC: Lythrum alatum (winged loosestrife). This species is not included in the IFBC key, but is described by Hitchcock and Cronquist (1973) as: Main leaves 3-10 cm, not cordate; petals purple, ca 5 mm; plants 4-10 dm. View a photo. Wet meadows, marshes, and ditches in the lowland and steppe zones; frequent on S Vancouver Island and common in the lower Fraser Valley; introduced from Eurasia. Purple loosestrife is the only tristylous plant found growing wild in British Columbia...As in distylous plants, the stamens of different lengths...produce pollen grains of different sizes and in different amounts. In purple loosestrife, there is a difference in the colour of the pollen as well. Pollen from long stamens is green, while pollen from mid-length and short stamens is yellow. The significance of the difference is not known. Purple loosestrife is the classic example of a tristylous plant and was thoroughly studied by Charles Darwin. Although Darwin is most famous for his theory of evolution by natural selection, he wrote several books on breeding systems and pollination of plants. In his autobiography he wrote that, of his many studies, none had given him as much pleasure as his investigations of the mating systems of heterostylous plants. Source: Extracted with permission from Griffiths and Ganders, 1983. Wildflower Genetics: A Field Guide for British Columbia and the Pacific Northwest. Purple loosestrife is sometimes confused with fireweed (Epilobium angustifolium). Both flower at the same time and are similar in colour. However, purple loosestrife is found only in wetland areas, while fireweed is a dry ground species. 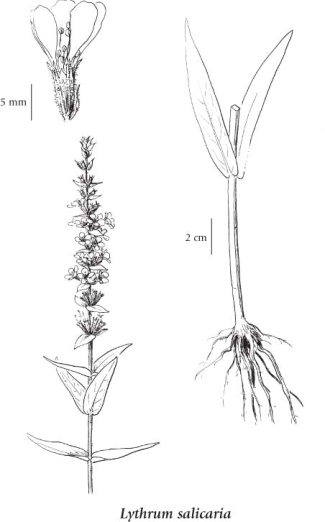 Purple loosestrife can also be readily identified by its rigid square stem with opposite leaves. Lythrum salicaria var. tomentosum (Mill.) DC. Environment Canada. 2007. Purple Loosestrife. St. Lawrence Centre Information. Available online. Griffiths, Anthony J. F. and Fred R. Ganders. 1983. Wildflower Genetics: A field guide for British Columbia and the Pacific Northwester. Flight Press, Vancouver. Myers, Judith. 1999. Biological Control of Purple Loosestrife in Vancouver, BC. Botanical Electronic News 233 [October 2, 1999]. Available online.